The S2928-P is a 19’’ case-shaped device with 1U high. It is with the internal industrial power supplies, have three optional power supplies—250W, 400W or 500W. All POE ports support both IEEE802.3af and IEEE802.3at Standard; each port can output 30W max. Extend Function: Power lightning protection. 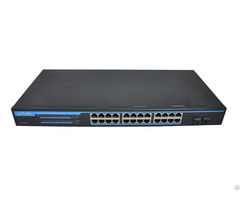 Fixed port 20 10/100/1000Base-TX ports. 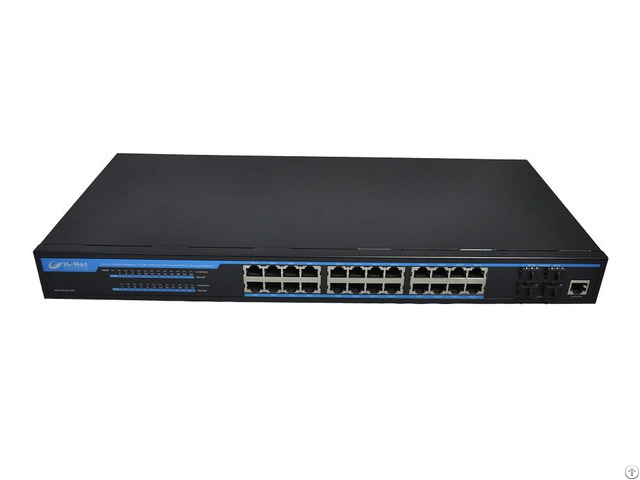 4 Combo ports (10/100/1000Base-T or 1000Base-X). LED Indicators PWR, PoE, 1000M and Link/Act LED. Thermal methods Built-in Noiseless FAN. PoE port 16/24 10/100/1000Base-TX ports. Pin assignment V+ (RJ45 Pin 1, 2), V- (RJ45 Pin 3, 6). PoE management Support Port-base PoE status view and control. MAC address table 8K, Support MAC address table management. MAC Address Learning control Control number of port-based MAC address learning. Jumbo Frame Jumbo packets up to 16379 bytes. VLAN 4K 802.1q VLANs, Support Ingress filter. Link Aggregation Up to 8 maximum aggregation groups, each containing up to 8 GE ports. Traffic control IEEE 802.3x full-duplex flow control. Multicast Support 256 Multicast groups. L3 VLAN interface Up to 32 L3 VLAN Interface. QoS 4 output queues on each port. Security Features Support MAC-based 802.1X authentication. CLI Support CLI (Commend Line Interface) configuration mode. Console Support Configuration via the console port. Telnet Support Local/remote configuration via Telnet. Business Description: Hi-Net Technology Co., Ltd is a professional high-tech enterprise which starts business from the networking products. 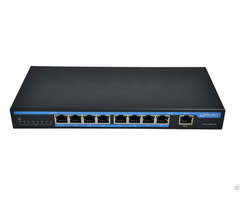 As a professional company in the network products, we are engaged in the study, design, production and marketing of telecommunication products which includes: L2/L3 switches, smart switches, POE switches and Industrial switches some of which have got the "CE", "FCC", "CCC" and "RoHS" certifications, and they have been sold to American, Mexico, EU, Mid-east, Australia and Southeast Asia, ect.